AccessArt believes in sharing ideas as a way of inspiring new audiences. We believe strongly that if we share examples of excellent practice in visual arts education, then we can all benefit. Teachers, facilitators, artists and learners can all feed into and out of this inspirational pot of ideas. Subscribers and members of AccessArt are able to use the resources featured on this site in their own practice, and in their educational work with other audiences (for example pupils, students, community audiences etc). Where possible and appropriate, please acknowledge AccessArt, and/or the artist educators sharing ideas, especially if you make reference online to sessions you have run which have been inspired by our resources, for example if you post images of your workshops on your website or facebook, please consider mentioning AccessArt. Remember AccessArt is a charity which aims to inspire teaching and learning in the visual arts – so please do spread the word! We work in collaboration with artists, educators, schools, museums, galleries and arts organisations to create our resources. We believe everyone has the right to be creative and by working together and sharing ideas we can enable everyone to reach their creative potential. Show your support by joining AccessArt from only £3.50 per month and enjoy full access to all our resources! Please use our logo (or a text link) to link to www.accessart.org.uk from your personal, organisation or school website, or facebook page. If you are able to feature our logo on any printed matter, pls contact us and we can send you a high res image. 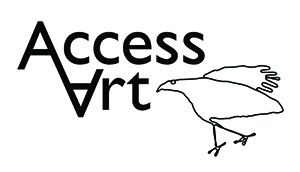 You can download the AccessArt logo here. If our resources have inspired you, or been used as the basis for a workshop you have organised, then please let us know. We like to see images and we LOVE to hear how you have extended or developed ideas. Remember if you are running an event or workshop based upon one of our resources, and would like some publicity, we can usually help out via social media. So get in touch before the event, and we can see how we can work together to help promote your work, and for you to promote AccessArt.